Oh! Curry on Stewart and Nellis was shut down November 8 for an imminent health hazard--a multi-generational cockroach infestation. 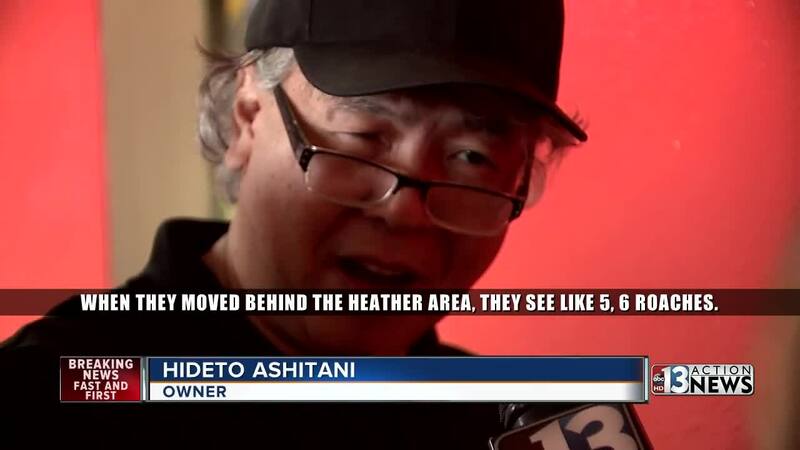 "When they moved behind the heater area, they saw like five, six roaches," Owner Hideto Ashitani told Darcy Spears. "They called it a swarm of cockroaches," Spears said, reading off the health report. "I don't know, I mean, it was already taken care of the next day," Ashitani said. Oh! Curry was back to a zero-demerit A grade on November 10 after deep cleaning and creating an action plan to keep the restaurant clean, which the Health District required as a condition of re-opening. "This is a seven-page health report," Spears said. "There are a lot of violations in here and a lot of them document dirty, greasy conditions in the kitchen that contributed to the cockroach infestation." "So the report says, but as I say, we solved the problem," Ashitani responded. The inspector saw a roach on a rolling cart used for storing clean kitchen wares. When the cart was pulled out, a swarm of roaches dispersed under the three-compartment sink, prep sink, rubber floor mats and behind the ice machine. Ashitani says the health inspector just happened to show up the day before their regularly scheduled monthly pest control service. The inspector found kitchen walls at Oh! Curry were dirty with particles of dead bugs, heavy spillage of old food debris and grease. The restaurant's pest control records from June, July and October show American and German cockroaches and conditions that allow harboring and feeding of pests. The technician told the health inspector he recommended multiple times that the restaurant be fogged. The inspector also noted multiple food safety violations involving raw chicken. An employee breaded raw chicken with bare hands, then handled rice without washing hands. The employee also wore the same gloves to handle raw chicken, then clean kitchen wares. And the same wiping cloth was used to wipe raw chicken off a prep table and then used on refrigerator handles and doors. There were also bulk packages of flour, rice, sugar and other seasonings stored open and subject to contamination, mold in the ice machine and excessive amounts of old food debris and heavy grease build-up on equipment and surfaces throughout the kitchen. "We do our best and this time, this happened," Ashitani said. He praised the Health District for helping him and his staff come into compliance. There were two other imminent health hazard closures for pest infestations: roaches at a Roberto's Taco Shop and mice at Dolce Vita Gelato. Roberto's on Craig and Nellis was shut down November 5 for a multi-generational cockroach infestation. It also got 32 demerits but was back to zero-demerit A on November 8. Inspectors noted improper handwashing after handling raw beef, raw shrimp stored over ready-to-eat salsa and employees' open drinks stored on the prep table. There was also food debris build-up on the can opener blade, black build-up along base coving and walls and soil accumulation and debris on the walls and floor in the mop sink closet. Debris had accumulated on shelving where clean dishes were stored, there were layers of black grease build-up on the back part of fryer and walls behind the soda dispenser and the cabinet under the soda machine had a large amount of brown build-up. Employees were re-using a cardboard box with no liner to store bacon, there was pink mold in the ice machine and the person in charge was not knowledgeable about food safety. The inspector noted that this facility has a documented history of non-compliant inspections. The owner had no comment. Dolce Vita Gelato on Valley View near Sunset was shut down November 6 for a rodent infestation. Inspectors saw mouse droppings on floors in the main kitchen, dishroom, electrical box and a box that contained parchment paper that's used in direct contact with the gelato. There were urine trails, rub marks and urine spatter on main kitchen floors and base coving. Inspectors documented gross, unsanitary conditions including excess debris and build-up on floors and base covings, food shelves and prep tables, equipment casters and stove inside surfaces. There was an uncovered block of white chocolate on a sheet pan that had some unknown gray substance directly on the food. Open bags of flour, nuts and candy in storage were not protected from contamination. Dirty utensils were stored as clean and there was dried food debris and build-up inside the gelato heating and cooling machine. Wet, dirty rolled up floor mats in the corner of the dish room allowed harborage for rodents and fruit flies. Inspectors noted numerous fruit flies in the kitchen. There was also sugar piled up on the floor next to the fire extinguisher. Dolce Vita was re-inspected November 9 and got a zero-demerit A grade. The owner said he wouldn't call the rodent issue an infestation because there weren't any actual sightings of the mice, but he said they cleaned everything up quickly and took measures to ensure that it won't happen again. Lastly, repeat offender China One on Durango between Twain and Flamingo got a 38-demerit C grade on November 9. Orange chicken was improperly cooled and chicken, shrimp, beef and fish past thawing were left on the counter unattended for an hour. Raw chicken was stored above vegetables in the walk-in, raw shrimp was next to raw beef on the prep table and more raw shrimp was next to raw chicken in the three-compartment sink. Bags of food were stored in the walk-in freezer on the floor, bulk bin scoops were dirty and so was the can opener blade. They were using a garbage bag to hold fried wonton wrappers and cardboard to line shelves and absorb grease on the floor. Food was not date labeled and there was an accumulation of soil and food debris throughout the facility cook line and prep area. Inspectors ordered a deep cleaning prior to re-inspection, which took place November 16 and resulted in a 6-demerit A grade. The owner said they corrected all the violations as quickly as possible and he was pleased to have the A grade back.